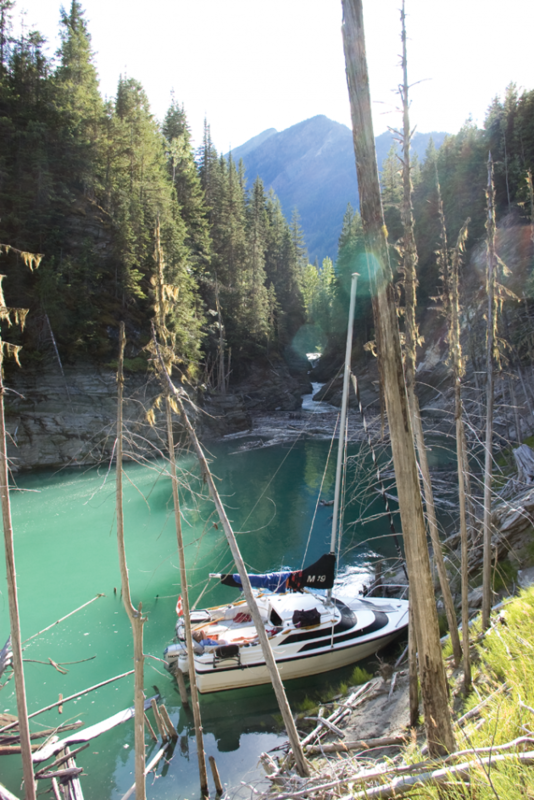 Over the past decade or so I have endeavored to try to sail all the major lakes and rivers of western Canada. So it would seem surprising that one of the smaller and easier to access lakes I had so far missed was Kinbasket Lake, which is only a two-hour drive from my home in Ghost Lake, Alberta, and, despite its close proximity to a large city, is a lake very few people have heard of. Early in August, eager to explore this close but unfamiliar lake, I left for the drive through the mountainous terrain to Donald Station, British Columbia, where the Trans-Canada Highway turns to cut through the spectacular Rogers Pass. Joining me were Vanessa, on her first sailing trip, and my seasoned feline crewmate, Typhoon. At Donald Station I turned off onto the old Big Bend Highway, from which it only took an hour to get to the point where the road drives directly into Kinbasket Lake, which was dammed in 1973 and made much larger, flooding the highway. This makes it a great boat launch, even if it can be a little rough when the lake level is low. As I rigged and launched our MacGregor 19, a steady stream of heli-hikers climbed into a helicopter that would then pass right over our heads as the hikers were whisked away to the towering mountains that surround the lake. By 2:45 p.m. we had departed onto a white-capped lake with brisk west winds and gleaming snow-capped peaks visible up the surrounding valleys. We sailed a short 12 miles the first day, anchoring in a beautiful inlet with good shelter and a beautiful waterfall at the end. Getting ready to prepare our first dinner, I discovered that I had forgotten all our utensils and our single pot did not have a lid. Oops. Not a way to impress the new girlfriend on her first sailing trip with me! I carved two spoons and some chopsticks for dinner from driftwood, which served us well for the rest of the trip.